The last thing you want to happen is to spend a good chunk of change coloring your hair to only have the color fade in a few weeks. 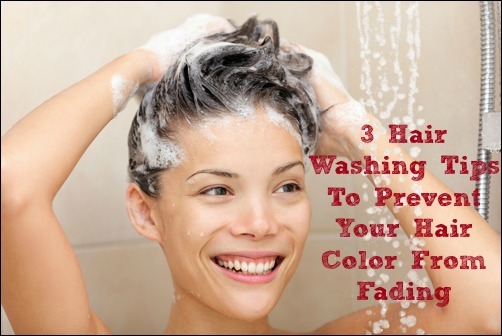 One of the biggest reasons behind a person’s hair color fading is due to improper washing of the hair. This means it is totally preventable and you can have great color for weeks and weeks if you wash your hair properly. No matter if you just have a few highlights or you dye your entire head of hair, follow these 3 important tips when washing your color treated hair. One surefire way to have your hair color fade as soon as possible is to wash it with shampoo right after coloring it. In fact lots of hair stylists actually use this technique to strip hair color that doesn’t turn out exactly right. The longer you wait to wash your hair with shampoo the longer the dye has to settle into the hair. This also means washing your hair with any type of warm water even without shampoo. Using the shampoo actually strips some of the color from the hair as well as the warm water draws out the color as well. If you combine these together and the dye hasn’t settled yet on the hair you will most likely have a color on your hair that is nowhere near the color you had before washing. Some people don’t realize this, but every time you wash your hair you actually lose a bit of color from the hair strands. This is especially true right after dying your hair, so if at all possible put off washing your hair as long as possible to keep your color shiny and new for quite some time. I would recommend to try to go at least 48 hours after coloring before you wash your hair. When you are ready to wash your hair, be sure that you are using a color safe shampoo so that it isn’t too harsh on the hair. A shampoo that is not for color treated hair and is too harsh on the hair can actually strip out almost all the color from the hair strands. Look for a shampoo that says it is color safe as well as gentle and moisturizing on the hair since colored hair can get dried out much easier. It is also a good idea to look for a sulfate free shampoo as these shampoos are known for easily stripping hair color out. There are lots of great color safe shampoos and conditioners that you can choose from. A good shampoo that is safe for color treated hair may cost a bit more, but is defintiely worht the money considering your hair color will last much longer. When you wash your hair, try to wash it in the coldest water you can. The cold water actually strips the color mush less than what hot water does. Hot water actually pulls the dye from the hair since it relaxes the molecules so much. You don’t have to wash your hair in freezing cold water but just make sure to turn the temperature down some when washing your hair. If you can’t take cold water, especially in the colder months, try for a lukewarm temperature for washing your hair. Also, try not to wash your hair too often even though it can be tempting to want to wash your hair every day, it really does strip the color from your hair quite quickly. Instead aim to only wash your hair at most 3 times a week. If you have to, use a dry shampoo for the days in between your washings to make your hair clean and less oily at the roots.